It is winter and very cold in Bangalore these days. It made me remember the food that my mom cooked during the really cold winters of the North during my childhood. Gajar ka halwa was a staple. 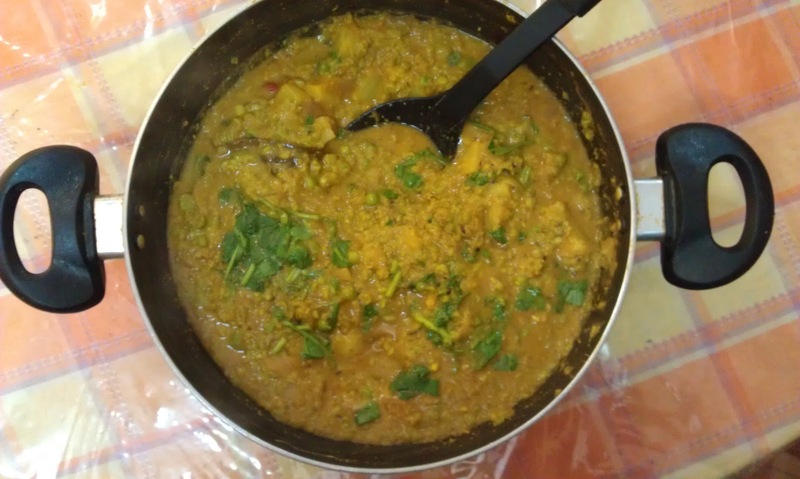 I also remember that she made a curried dish of peas, and I have been trying to recall its name since many days, only remembering that the name resembled a disease :). Yesterday, it struck me — Nimona. I know weird name, but I looked up on the internet and found the recipe for the Awadhi Nimona that my mom made. So, I took the recipe that looked closest to the dish (Tarla Dalal one) I remember and made it yesterday. It did turn out pretty decent. Made with crushed peas and potatoes, it tastes different from the normal peas-potato gravy that we cook perhaps due to the sweetness of fresh peas that are coarsely crushed for the gravy. This is not restaurant-type dish but good, wholesome homecooked food. So, hopefully I will continue making it through the winter. You see the picture of my effort above. Hmm, looks good, I’ve written down the name to give it a shot myself. @BKC Sure! Hope the same for you. Wish you and your family a very happy new year. @bbsearchingself hehe No, actually that’s true. How do I choose among so many bloggers, some of them I have been following for years. Thanks by the way for your cute way of remembering your friends. @Bart Let me know how it turned out. @Insignia I know, it is a very local dish so to say. I know the cold has been intense. I agree, it is tough to pick specific posts. @Shilpa I can understand. Not a very well-known dish, so I was surprised that the recipe was available online :). Thanks dear and to you too. I dedicated the award to all my blogger friends :). @bhupesh Long time! ok, someone has heard of it and loves it too. Have you heard of buknu (a powder)? I am trying to find its recipe. @irfan yes it is :). Wish you the same. @Jane warm wishes to you too! ..good to see some recipe..NIMONA sounds interesting,, gr8I will try frm net :)something new and different ..I guess! 🙂 the nimona part did sound like a disease, but the dish sounds differ. ent. I will try it. Going over to Sid’s blog. @Harman Sure, see if you like it. @cybernag It does sound like a disease, very close to pneumonia. I wonder how this weird name came about :). Oh Sid will be so happy that you visited. He is very thrilled every time he gets a comment :). I have tasted Nimona several times ,one of our neighboour from Kanpur used to make it often.It is a great dish.Congratulations for the award and for the new blogger in the family .Wishing you A Merry Christmas and A Very Happy 2012. Nimona does look good:)A very merry Christmas to you and your boys! @kavita sometimes, these lesser known regional dishes have their own charm. Wish you happy holidays too. @destiny’schild and Jyothi wish you happy holidays too. @Rahul Hi, welcome to my blog. Sure, just google nimona recipe and pick the recipe by Tarla Dalal. That is the one I made. Make sure that peas are coarsely crushed and not made into a paste. Let me know if you like it. Oh! Nimona. Strange that you had to associate it with pneumonia. I remember to have encountered this dish at a friend’s place. Winters bring tons of happiness in form of Gajar ka halwa and Nimona:)Merry Christmas! @PNSubramanian I guess it has to do with the sound of it :). @bikram 🙂 Sure! @Rahul Bhatia Yeah, winter has its own charms. Hey Avadhi Nimona looks so yummy…I’m sure kids will love it the way you do till today…wish you a happy new year ! It always feels good when you are able to make a dish just as good as your mother. It brings back such pleasant memories.Merry Christmas and a Happy New Year! @maverickshree I hope so! Wish you a happy new year too! @sujatha wish you a happy new year too. @rama you are right. It does bring back fond memories. Although, I don’t think that I can cook as well as my mom, but I do try to remember her legacy. Wish you a very happy new year. @vijay hehe wish you a happy new year too. Wishing you belated happy cristmas and new year wishes in advance..when can I have a taste of that Nimona?